As the busiest cruise port in the world, Miami see its fair share of passengers driving in for their vacation. Of course, that means that they need a place to park. Located on Dodge Island, which is just across the bridge from downtown, the cruise ports are in a busiest area of town where parking space is at a premium. Still, if you need to park for your cruise, then you’ll have no problem finding a spot. The port itself offers convenient parking, but it comes at a steep price. That’s why it pays to know your options. Prices vary considerably, based mainly on convenience to the port. As a rule of thumb, the closer you park to the ship, the more costly it will be. The most expensive parking, located right at the port, is also the easiest to use. Luckily, there are other options if you are a bargain hunter. (Note: If you are planning to spend a night in the area, check out our page of Port of Miami hotels with cruise parking or Miami hotels with port shuttles. These hotels can help you save money on parking or transportation to the port. A parking garage at the Port of Miami, as seen from the cruise terminal. One thing we’ve noticed in researching and updating this article is that there are a number of parking lots that show up on some third-party websites, but are difficult to find reliable information about. We’ve left those options off our list. While it is the priciest option, we recommend that cruise passengers park at the official port lots. The port offers onsite parking that is very convenient, reliable, and patrolled by security. Parking comes in both covered (parking garage) and uncovered lots. The good news is that there are several options for where to park, so you can always find a lot that’s near your cruise ship. Simply follow the signs to your ship as you arrive at the port and you’ll find the parking lot or garage nearby. For the convenience of parking here, be prepared to pay the price. Overnight parking is $22 per day ($154 for a 7-day cruise). Parking is available for oversized vehicles, but will cost extra. You should note that credit cards and cash are accepted. However, debit cards are not. Want to save some money? Disabled passengers in vehicles with specialized equipment (such as lifts or foot/hand controls) and those with Florida disabled veteran license plates can park for free. Safe Cruise Parking offers a good deal, a walled-in and gated lot, and 24/7 security. That’s a pretty compelling offer for a rate that’s considerably less than the cruise parking lots at the port. Prices are about $8 per day, but taxes and fees increase the cost to about $10 per day for a week-long cruise. We were quoted $67 for a week-long stay. That’s a total of under $10 per day — less than half the rate of parking at the port. The lot is located about 2.5 miles driving from the cruise terminals. A shuttle runs regularly to the Miami port and is free. Reservations are available on their website, which we recommend to ensure you have a spot when you arrive. If you want to park in a garage where your car is protected from the searing Miami sun, then look into this company. Its lot is actually a garage offering multiple levels of covered parking. The garage is located about a mile from the port and offers a free shuttle to and from the cruise terminal (the MET3 parking garage in downtown Miami). Rates run about $8 per day. With taxes and fees you can expect to pay about $65 in total for parking on a one-week cruise. No oversize vehicles are allowed. This company offers several different parking lots located around town for cruise passengers. Prices range from $8.95 per day to $20 per day. When making a reservation there are three different lots available to choose from. But elsewhere on the website other parking lots (and different prices) are mentioned. This can be confusing if you are trying to make a reservation through the website. As well, we found trying to book one location would lead to a reservation that showed a different address. Still, if you want discounted parking it can’t hurt to give the company a call to confirm that you are booking the correct locations. The prices are good compared to the port and free shuttles are provided to the port. If you are staying in the Miami area, contact your hotel to see if they will allow you to park your car for the length of your cruise. Many hotels cater to cruisers and have special daily rates and free shuttles. Here is a list of some hotels offering Port of Miami parking for your cruise. Here is a list of hotels with cruise port shuttles. Which parking lot should I use? While it is expensive, we would suggest the parking at the Port of Miami. Navigating Miami can be difficult, so it’s nice to be able to park right at your ship and simply walk across a street to board. It’s also convenient in that you don’t have to pre-book or reserve anything. You simply arrive at the port on cruise day and park. Can I park for free anywhere during my cruise? It be great to be able to park for free, but it’s only available in a few situations. First, if you are disabled and your automobile has modifications (such as a ramp), then you are able to park for free at the Port of Miami. As well, those with Florida disabled veteran license plates can also get free parking. If you don’t meet one of those two groups, don’t despair. You can park for free (or a discount) at a number of hotels in the area in exchange for a night’s stay. These hotels offer parking as a perk to attract cruise passengers. See a list of Miami hotels with cruise parking here. What time should I arrive if I am parking? If you plan to park at the port, we’d suggest arriving 30 minutes before you plan to board. So if you want to board the ship at noon, arrive at 11:30. This will offer plenty of time to park, find your way to the ship and get checked in. If you plan to park at an off-site parking lot, then we’d up that time to an hour before you board. This gives you plenty of time to park and then shuttle to the cruise ship. Do I need to reserve a parking spot before I arrive? If you plan to park at the port, you don’t need to reserve any sort of parking. There are spots available and you simply pay when you arrive. For other lots, you’ll want to reserve ahead of time to ensure that they have space available. Getting to the Port of Miami — Transportation options from airports and the Miami area to the cruise port. Everything you need to know to get to the port and start your vacation. Miami Cruise Parking — Parking at the port? We’ve got you covered with all your parking options, including costs and discounts. 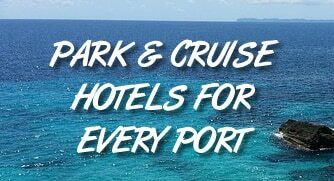 Miami Park and Cruise Hotels — If you plan to stay in Miami the night before your cruise, look at this list of hotels that offer cruise parking with a one-night stay. Can I part à 24 foot RV, if so, how much is it? Yes, parking is available. It costs $44 per day for an oversized vehicle. Greetings – how do I make a reservation to park at the port of Miami? If you want to park at the port, reservations aren’t required. Simply show up on cruise day. Disabled customers pay the same rates? Other than disabled Florida veterans, Does U.S veterans get a discount? Glen — we don’t see anything about that. It’s still worth a shot to ask when you arrive. Looking for a hotel to stay and park for your cruise from Miami? The hotels below all provide cruise parking packages. Click each link to read reviews on TripAdvisor, or click here to read our article on their parking packages.